Late Friday afternoon I received an unexpected call from an eleven year old Detroit boy. His father was Darnell “Hard” Knox, a heavy-hitting boxer well known to those of us who followed boxing in the 1980’s. I mean, Darnell was really good. At 6’1″, about 155 pounds and hitting southpaw, he was always a knockout threat. 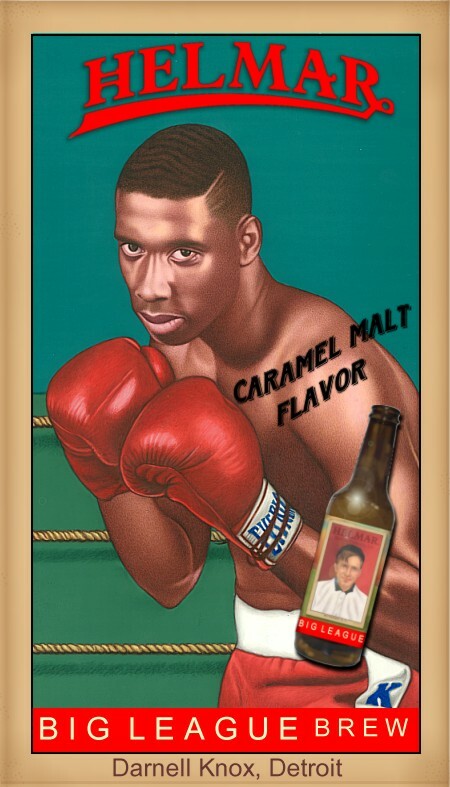 Darnell’s career was eventually handled by Detroit legend Emanuel Steward. In late October of 1987 Steward set up a fight at the Las Vegas Hilton with Michael Nunn for the NABF Middleweight Title. It may have been one step too far, for Nunn not only stopped Darnell but busted his nose quite badly. Knox, then just 26 years old, never fought again. His lifetime record was 26-2 with 20 knockouts. When I was putting together the first series of Helmar’s Famous Athletes series back in 2003, I just knew that I wanted to include a card of Darnell. I tried finding him without success but decided to include the card anyway. I thought that he would like it if he ever came across it. After the cards were printed and distributed in our potato chips, I tried to find him once more–this time to see if he would autograph one for me. Again, no luck. The story would have stopped there if I hadn’t received that wonderful call from his young son. It seems that Darnell passed away in 2004 from a brain tumor. His son, now eleven, has been doing Internet searches on his father and came across a picture of the card that we’d made. He’s such a delightful young man! I’m going to mail him a few cards plus a large, framed print of the artwork. « What am I working on? New L1-Helmar Leathers. REST IN PARADISE TO MY BIG BROTHER DARNELL HARDKNOX. Yolanda, thank you for giving us an update on Victor. He has a very appropriate first name for the son of a great boxer! Did you see that Jose Fuentes had offered a video of his fight with Darnell? A beautiful card and a very nice memento for Darnell’s son. I’m sure the items you sent him will be treasured by the Knox family for years to come. Very kind of you, Charles. Darnell Knox’s son Victor Knox is now 16 years old and he is doing very well academically and pretty good in football also. Thank you do much for the cards. They mean a lot to our son.